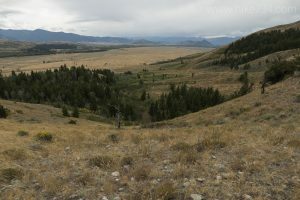 For a unique view of the southern end of Jackson Hole, take this out-and-back trail that explores the prominent butte formation in the middle of the valley. The trail starts near a popular rock climbing area. Skirt the butte’s western edge amongst aspens, where you’re treated with the vast sagebrush meadows of Jackson Hole and views of the iconic Teton Range before ducking into the forest. From here, the trail steeply ascends through the trees with occasional boulder fields, then meadows as it follows a seasonal stream. The meadows give you a few peeks of the Tetons. The views open up to a sprawling vista on a knob that is easily mistaken for the end of the trail. However, the trail continues heading south, down through the trees and across meadows as it traverses the length of the butte. 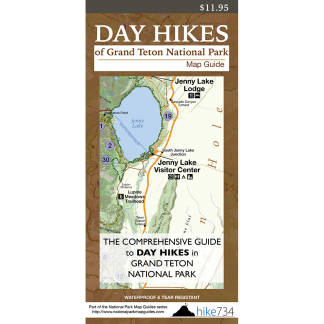 It steeply drops as it reaches the south end of the butte, emerging to fantastic views of the Gros Ventre Wilderness and River to the east and the town of Jackson to the south. The southern slopes of this butte are a calico collection of evergreens, aspen, and sagebrush meadows. Trailhead: The road to the trailhead is between Antelope Flats and Moose Junction on the east side of Hwy 191. The trailhead is at the parking lot just after turning onto the road.